The redbreast sunfish (Lepomis auritus) is a species of freshwater fish in the sunfish family (family Centrarchidae) of order Perciformes. The type species of its genus, it is native to the river systems of eastern Canada and the United States. The redbreast sunfish reaches a maximum recorded length of about 12 in (30 cm), with a maximum recorded weight of 1.7 lb (790 g). The species prefers vegetated and rocky pools and lake margins for its habitat. Its diet can include insects, snails, and other small invertebrates. 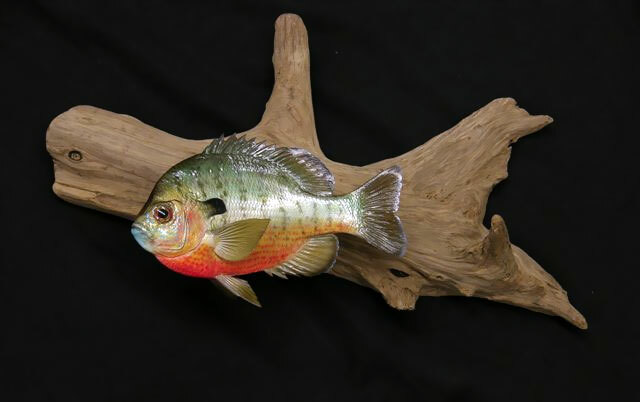 A panfish popular with anglers, the redbreast sunfish is also kept as an aquarium fish by hobbyists. Redbreast sunfish are usually caught with live bait such as nightcrawlers, crickets, grasshoppers, waxworms, or mealworms. They can also be caught using small lures or flies. Most anglers use light spinning tackle to catch redbreast sunfish. It is popular with fly anglers in the winter because it will more readily strike a moving fly than will bluegills in cooler water. As is typical for the sunfishes, the female redbreast sunfish lays her eggs (about 1000) in a substrate depression built by the male. The male guards the eggs and fry.